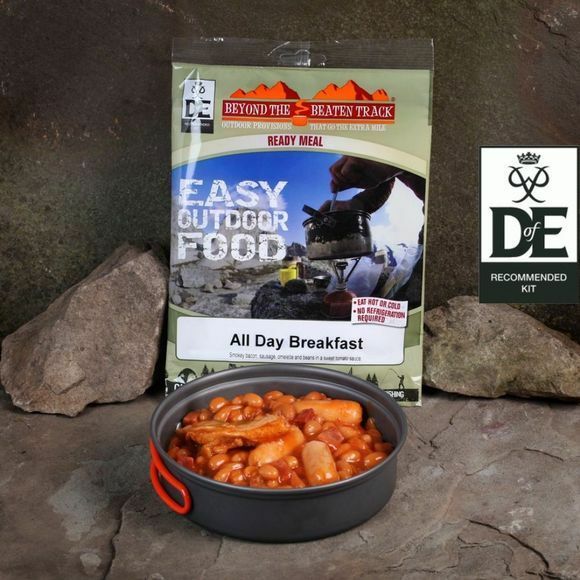 The All Day Breakfast from Beyond the Beaten Track is a hearty meal of smokey bacon, sausage, omelette and beans in a sweet tomato sauce, perfect for overnight adventures. The All Day Breakfast is ready to eat hot or cold, does not require refrigeration and has a long life shelf life. Beans (27%), water, pork sausages (15%)(rehydrated textured vegetable protein (water, soya protein, potato starch, wheat gluten, stabiliser: dicalcium phosphate), water, onion, rapeseed oil, seasoning (natural flavour, dextrose, yeast extract, herbs & spices, salt, sugar, rapeseed oil, herb & spice extracts), dried egg white, soya protein isolate, stabiliser: methyl cellulose), vegetarian ham (11%)(rehydrated vegetable protein [contains: water, soy protein, wheat gluten, isolated pea protein, potato starch, wheat starch, calcium chloride, iron oxide], sunflower oil, cane sugar, flavourings [contains: salt, yeast extract, flavourings, dextrose and spices], stabiliser: carrageenan gum; fermented rice), omelette (8%)(pastuerised whole egg, water, vegetable oil, milk powder, salt, stabiliser: xanthan gum; pepper), tomato puree, sugar, vegetable oil, modified maize starch, wheat flour, salt, emulsifiers: E472e, E415, E412; colour: paprika extract; onion powder, paprika, flavouring.